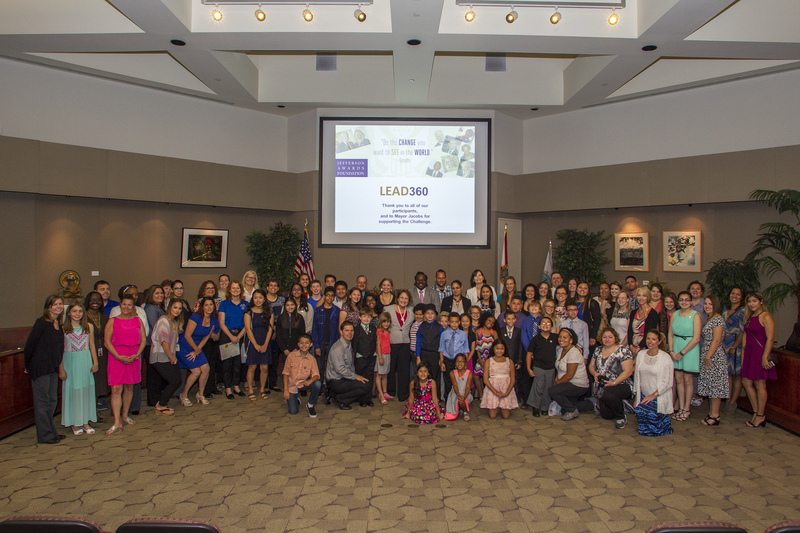 Orange County Mayor Teresa Jacobs and the Orange County Board of County Commissioners (BCC) recognized a group of young citizens who participated in the Jefferson Awards Lead360 Challenge on Tuesday. This program engages and celebrates America’s youth for their efforts in making a difference and inspires young people to participate and coordinate public service projects in their community. The Jefferson Awards, founded by Jacqueline Kennedy Onassis, U.S. Senator Robert Taft, Jr. and Sam Beard, is the country’s longest standing and most prestigious organization dedicated to activating and celebrating public service. Mayor Jacobs also selected three projects that stood above the rest and impacted the community. Serving With Pride created by the BETA Club at East River High School in East Orange County, the Sunday Knight Food Share from University of Central Florida student Todd Currie and Youth Empowerment Leadership Learning presented by International Baccalaureate students from Cypress Creek High School in the South Chase/Hunters Creek area, all received a medal on behalf of Mayor Jacobs for their outstanding community work. Eagle Scout and 2013 Orange County Distinguished Citizen of the Year Daniel Bolan, was also acknowledged for his recognition as one of the top 27 national finalists of the Jefferson Awards. His work with local church leaders and area scouts to create a “Mercy Garden” in West Orange County in memory of local victims of violence is a demonstration of his passion for service and commitment to Orange County. Overall, the efforts of these students and teachers from Orange County engaged 3,000 volunteers, garnered more than 16,000 volunteer hours, and impacted more than 22,600 people in our community. Visit Click Orlando’s website to view WKMG Local 6’s news feature on the awards. A collection of photos from the BCC meeting can be found on Flickr for media use.